Մեջբերում Դոնա Բադսի «Արվեստի ճանաչողության լեզուն» (The Language of Art Knowledge) գրքից. Cut-up տեխնիկական հնարքը կոլաժի մի տարատեսակ է` արտահայտված բառերով. Տրիստան Ցառան դադաիզմի մանիֆեստում այսպես է այն բնութագրում. ↑ 6,0 6,1 6,2 Budd, Dona, The Language of Art Knowledge, Pomegranate Communications, Inc.
↑ Dada at thearthistory.org, retrieved March 13, 2017. ↑ Tom Sandqvist, DADA EAST: The Romanians of Cabaret Voltaire, London MIT Press, 2006. ↑ Marcel Janco, "Dada at Two Speeds," trans. in Lucy R. Lippard, Dadas on Art (Englewood Cliffs, N.J., 1971), p. 36. ↑ Europe of Cultures. 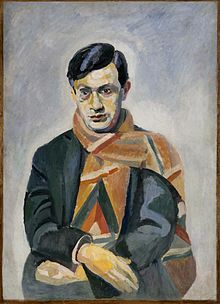 "Tristan Tzara speaks of the Dada Movement. ", September 6, 1963. Retrieved on July 2, 2015. 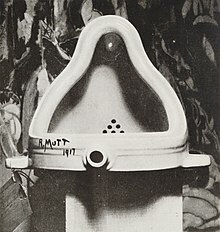 ↑ "Duchamp's urinal tops art survey", BBC News December 1, 2004. ↑ Duchamp, Marcel trans. and qtd. 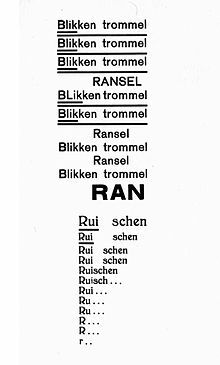 in Gammel, Irene. Baroness Elsa: Gender, Dada and Everyday Modernity. Cambridge, Massachusetts: MIT Press, 2002, 224. ↑ Gammel, Baroness Elsa, 224–225. ↑ Marc Dachy, Dada : La révolte de l'art, Paris, Gallimard / Centre Pompidou, collection "Découvertes Gallimard" (nº 476), 2005. ↑ Dubravka Djurić, Miško Šuvaković. Impossible Histories: Historical Avant-gardes, Neo-avant-gardes, and Post-avant-gardes in Yugoslavia, 1918–1991, p. 132, MIT Press, 2003. 9780262042161; Jovanov Jasna, Kujundžić Dragan, "Yougo-Dada". "Crisis and the Arts: The History of Dada", Vol. IV, The Eastern Orbit: Russia, Georgia, Ukraine, Central Europe and Japan, General Editor Stephen C. Foster, G.K. Hall & Comp. Publishers, New York 1998, 41–62; Jasna Jovanov, Demistifikacija apokrifa: dadaizam na jugoslovenskim prostorima 1920–1922, Novi Sad: Apokrif, 1999. ↑ Михайлов А.. Маяковский. Жизнь замечательных людей. — М.: Молодая гвардия. — 1988. — 560 с. — ISBN 5-235-00589-9. 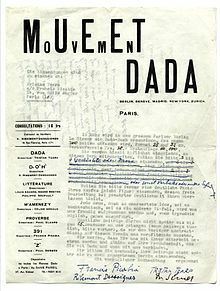 ↑ «manifestos: dada manifesto on feeble love and bitter love by tristan tzara, 12th december 1920»։ 391։ 1920-12-12։ Վերցված է 2011-06-27 This article incorporates text from this source, which is in the public domain. Gammel, Irene. Baroness Elsa: Gender, Dada and Everyday Modernity. Cambridge, Massachusetts: MIT Press, 2002.